At the invitation of the government of Vietnam, State Councilor and Foreign Minister Wang Yi will lead a delegation to attend the 6th Greater Mekong Sub-region (GMS) Economic Cooperation Leaders' Meeting and pay an official visit to Vietnam from March 30 to April 2. 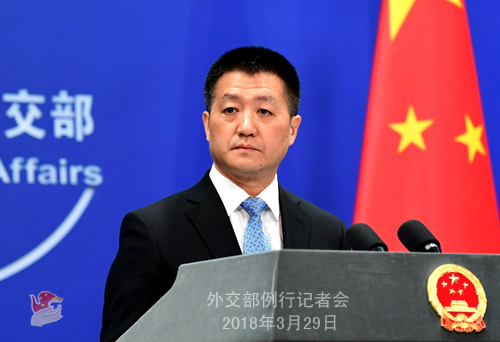 At the invitation of State Councilor and Foreign Minister Wang Yi, member of the Federal Council and head of the Federal Department of Foreign Affairs of the Swiss Confederation Ignazio Cassis will visit China and hold the first round of China-Switzerland Foreign Ministers' Strategic Dialogue from April 2 to 4. Q: The DPRK and the ROK decided today that their leaders will meet on April 27. What's your comment? A: The DPRK and the ROK held high-level talks today in which they agreed on the date for a meeting between their leaders. We welcome this and commend the efforts made by the two sides to this end. 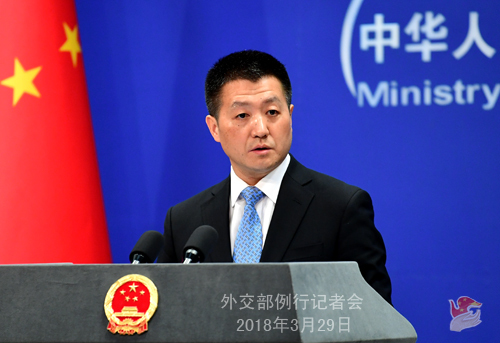 As a close neighbor of the Korean Peninsula, China is always pleased to see that the two sides engage in dialogue, improve their relations, and promote reconciliation and cooperation, as this serves the common interests of both sides and is conducive to the further amelioration of the situation on the Peninsula and promoting regional peace and stability. Since this year, positive changes have taken place on the Korean Peninsula with dialogue again becoming the dominant theme of the Peninsula. As we all know, this is what China has persisted in and promoted for. We hope that the momentum of dialogue can be sustained and the peaceful situation maintained. We also call on all relevant parties to jointly support the DPRK and the ROK in improving their relations, make concrete efforts to promote peace talks, advance the process of denuclearization and political settlement of the Korean Peninsula issue and make peace, stability, development and prosperity the backdrop of the Peninsula and the region. Q: Sources said that Japan and the DPRK have started discussing the meeting between their leaders. What is your comment on the exchanges between the leaders of Japan and the DPRK? A: We have said many times these days that currently the situation on the Korean Peninsula is improving and important steps have been taken in the right direction. We certainly welcome that the dialogue between relevant parties can be conducted in a smooth manner and that we can make concerted efforts to sustain the momentum of dialogue, the peace and stability of the Peninsula and the settlement of the Korean Peninsula issue through dialogue. Q: What is State Councilor and Foreign Minister Wang Yi's schedule for the Greater Mekong Sub-region (GMS) Economic Cooperation Leaders' Meeting? A: As an important platform for the Greater Mekong Sub-region economic cooperation, the GMS program has made positive contributions to the development of countries in the sub-region over the years. 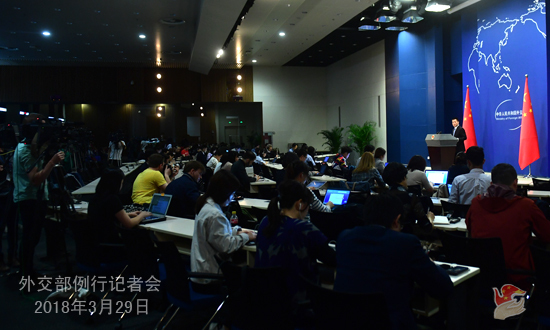 State Councilor and Foreign Minister Wang Yi's attendance at this meeting on behalf of the Chinese government testifies to the importance China attaches to promoting the sub-regional cooperation and developing friendly relations with sub-regional countries. State Councilor and Foreign Minister Wang Yi will attend the closed-door meeting, large-group meeting, the business summit and other events and hold bilateral talks with leaders attending the meeting. State Councilor and Foreign Minister Wang Yi's attendance at the meeting this time is expected to help deepen political mutual trust, good neighborliness and mutually beneficial cooperation between sub-regional countries and scale sub-regional cooperation to new heights. Q: Recently India has taken positive measures to improve its ties with China including canceling a visit by Dalai Lama to Sikkim. Does China welcome this? What is your comment on the latest development of China-India relations? A: Over a period of time, thanks to the concerted efforts of the two sides, China-India relations have maintained the momentum of positive development and new progress has been made in exchanges and cooperation across the board. China attaches importance to developing its ties with India. We are willing to join hands with India to follow the guidance of the important consensus reached by the leaders to maintain exchanges at all levels, enhance political mutual trust, expand mutually beneficial cooperation, properly handle differences and move forward China-India relations along the right track. Q: What's the purpose of State Councilor and Foreign Minister Wang Yi's visit to Vietnam at this point? A: State Councilor and Foreign Minister Wang Yi's visit will be the first one that the Chinese leadership pays to Vietnam after the new government was elected. It reflects the importance that China attaches to developing bilateral ties and the sustained and sound development of China-Vietnam relations. During the visit, State Councilor and Foreign Minister Wang Yi will meet with principal Vietnamese leaders and hold talks with Deputy Prime Minister and Minister of Foreign Affairs Pham Binh Minh. The two sides will have an in-depth and thorough exchange of views on how to better implement the outcomes of General Secretary and President Xi Jinping's visit to Vietnam, enhance bilateral strategic communication and mutually beneficial cooperation in various fields, and move forward the China-Vietnam comprehensive strategic cooperative partnership. Q: According to reports, at a press briefing on the Nepali government's foreign policy recently, Nepal's Prime Minister KP Sharma Oli told foreign diplomats that the country will follow an independent and balanced foreign policy and maintain friendly relations with China and India, its two largest neighbors. What is your comment? A: China appreciates the Nepali government's independent foreign policy and supports Nepal in developing friendly and cooperative relations with its neighboring countries. China, Nepal and India are each other's important neighbors, and we hope that the three parties can work together to reinforce each other's efforts to achieve common development. Q: According to reports, Myanmar's federal parliament on March 28 elected Win Myint as the country's new president. What is your comment? A: We have taken note of relevant reports. Yesterday, President Xi Jinping sent the congratulatory message to Mr. Win Myint on his election as President. China and Myanmar are traditional good neighbors. In recent years, the two countries have maintained frequent high-level contacts, expanded practical cooperation, conducted active cultural and people-to-people exchanges and kept close coordination in multilateral affairs. China stands ready to work with Myanmar to continue to cement our traditional friendship, deepen mutually beneficial cooperation and move forward the China-Myanmar comprehensive strategic cooperative partnership so as to deliver more benefits to the two countries and two peoples.